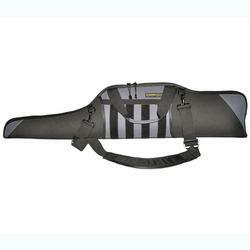 Crossfire Shooting Gear manufactures holsters, range bags, cases, and accessories. They are known for their innovative design, such as the Vera-holster system that allows the user to connect the shoulder bandolier strap so the holster can be converted to a shoulder holster. Crossfire Shooting Gear also provides a range of holsters for revolvers. The Alaskan holster is a low profile Vera-holster that converts from a hip/belt holster system to a fully functional shoulder holster system. It is fully ambidextrous that can work as a cross draw or traditional carry. The Crossfire Safari holster has all the same features of the Alaska. In addition, the Safari has the feature that allows Crossfire accessories, such as ammo pouches, flashlight pouches and multi-pouches to dock to the side of holster. The Stealth is a low profile thin revolver holster. It has the Crossfire Spring-loaded hammer retainer strap system.